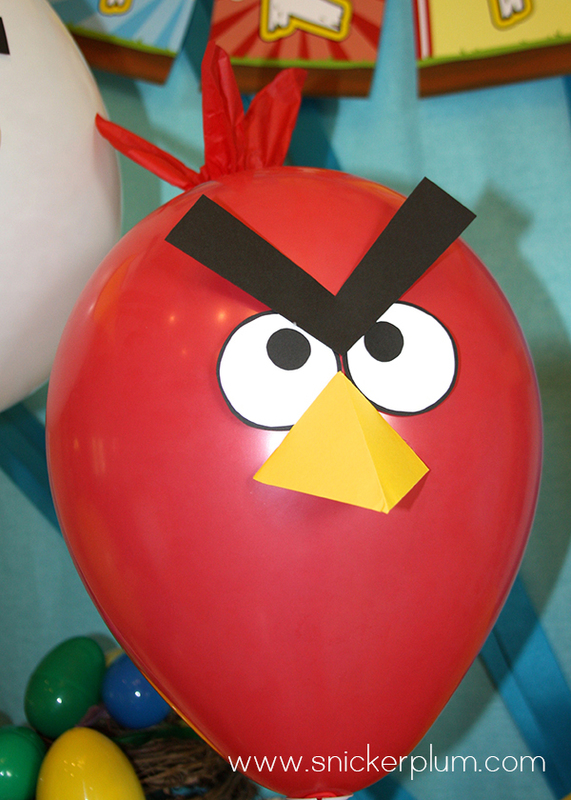 I was hoping to post this sooner, and then I got afraid that Angry Birds “weren’t in fashion” anymore. But I was told they are still very much a part of little boys lives…so I’m happy to share all the fun stuff we did with this party! I’m going to start with the backdrop. I got one of those huge butcher paper rolls and cut a section and taped it to the wall. Here is a website where you can purchase the paper for a decent price. 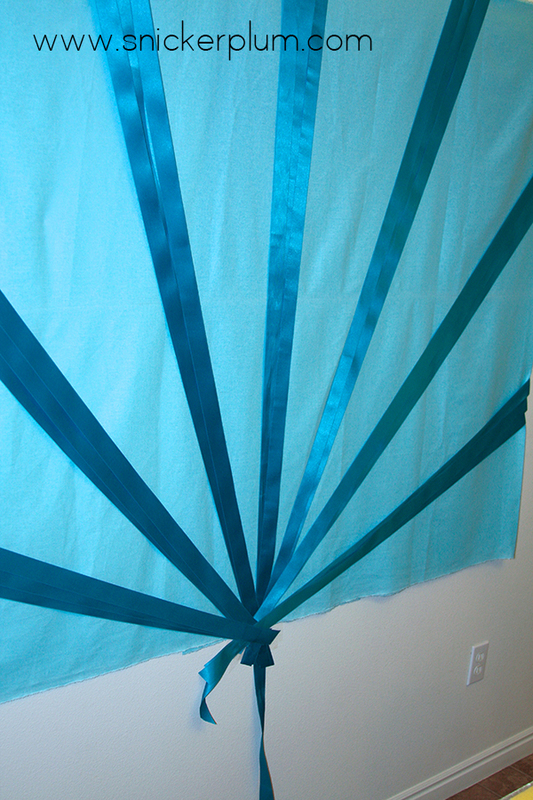 I was planning on using crepe paper rolls for the stripes, but the color was so close to the paper already on the wall that I needed something darker, which is why I went for thick ribbon. Obviously crepe paper is cheaper, but I had the ribbon on hand already- so it saved me a trip! 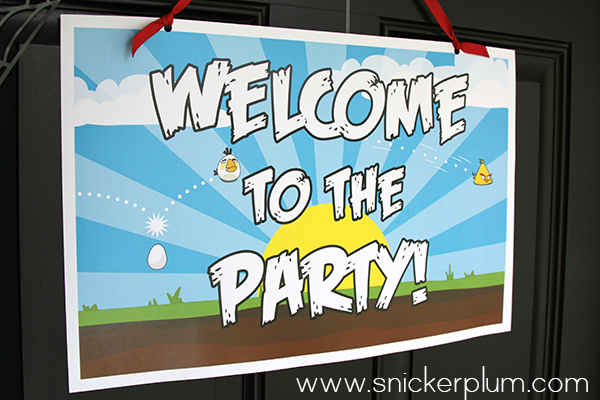 The idea was to match the background that is on the invite and welcome sign. One you have your crepe paper or ribbon, cut several strips and use double sided tape to tape them to the paper as well. You can see I had them all meeting at one point, which will be covered up by the “sun” portion. Then use a big bowl to cut out a circle from yellow construction paper, then cut that in half and tape to the wall and cover up the loose ends of the ribbon. 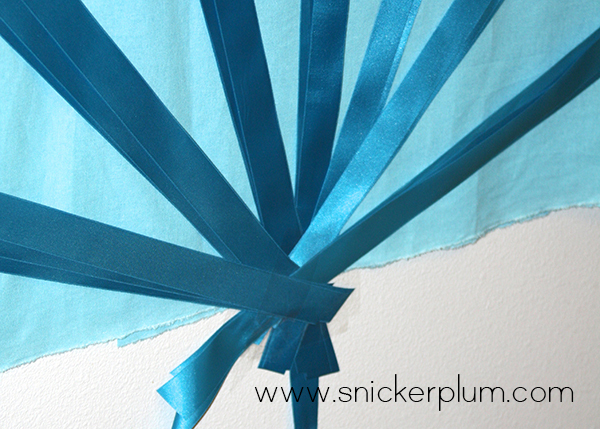 Once the background was up, I used more ribbon to thread through my banner and hung that up in front of the background. Side note: I’ve changed how I’ve started selling my banners. You can purchase the banners separate from the package, and you can have it customized! 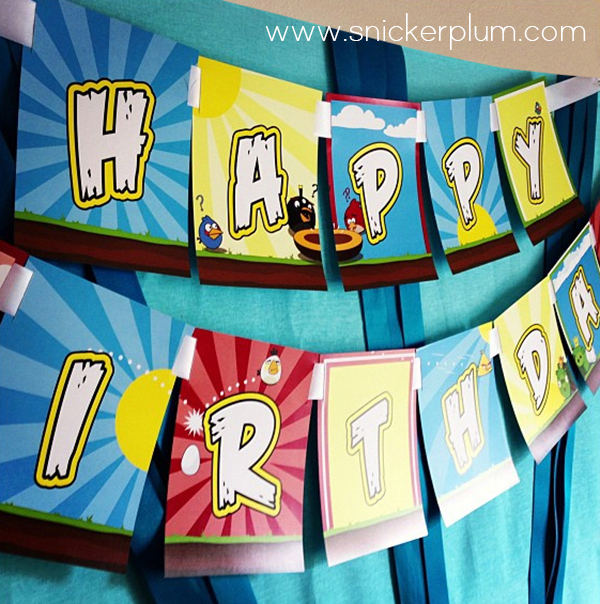 Instead of saying “Happy Birthday”, you can choose whatever saying you want…you get up to 18 letters! 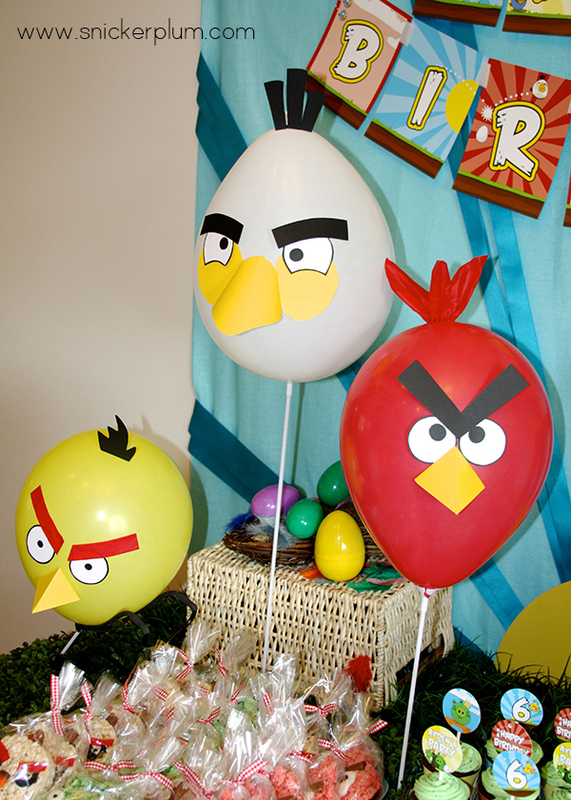 One of the next things I did, which isn’t included in the party….is the bird balloons. I have to admit, this was one of my favorite things to put together. 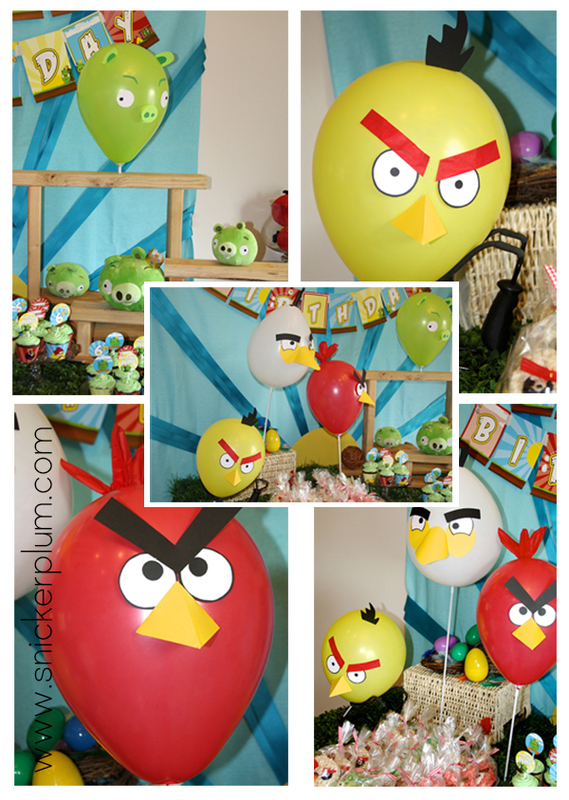 I had so much fun creating these and they were a huge hit! 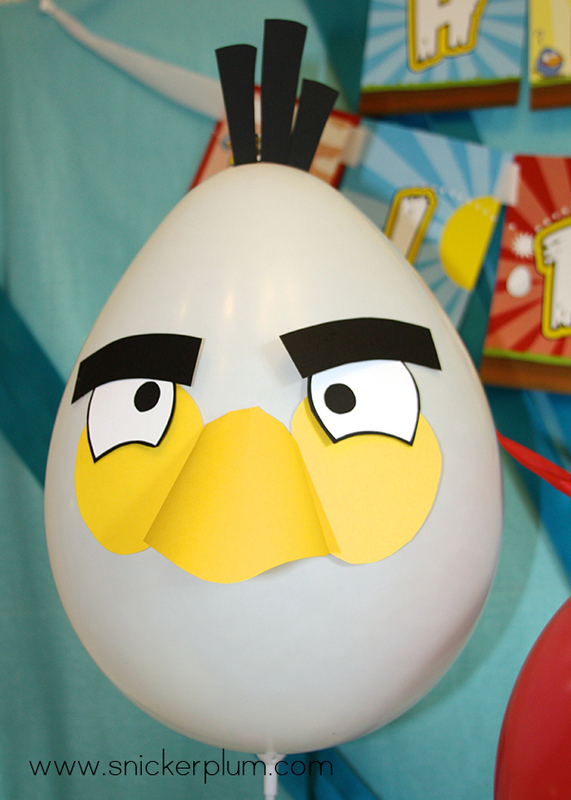 I purchased red, yellow, and white balloons from Party City, and then grabbed some construction paper/cardstock and started cutting. I had a picture in front of me of what the creatures looked like, so I did my best with trying to mimic their looks. I cute white and black circles of various sizes for the eyes, used black rectangles for the eyebrows, and cut a yellow diamond and folded it in half, for the beaks. One of the things I tried to accomplish for this party was to use a “story”. And by that, I mean I have a way of setting it up so it’s like it’s playing the game. 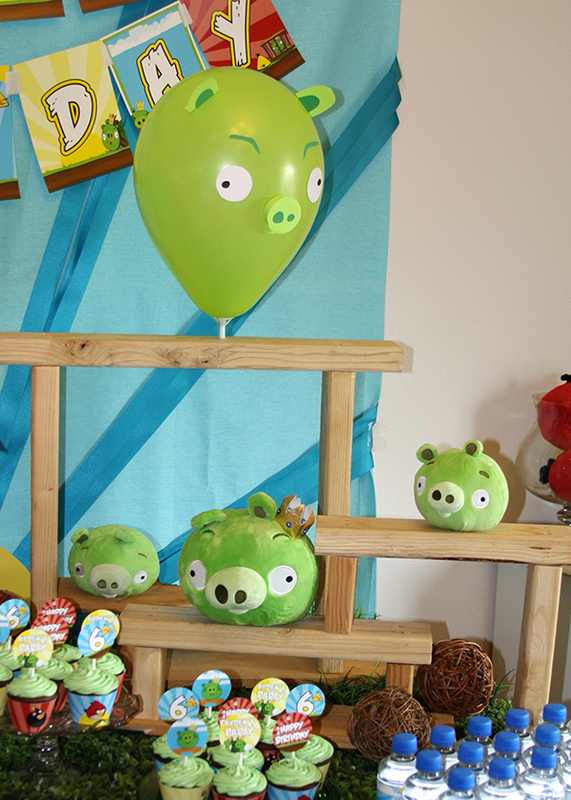 On the left, I had the bird balloons that were supposed to be “launched” at the pigs. They were taped down by string in various heights. I also had a sling shot on the table as part of the decorations- to play into the story of the game. 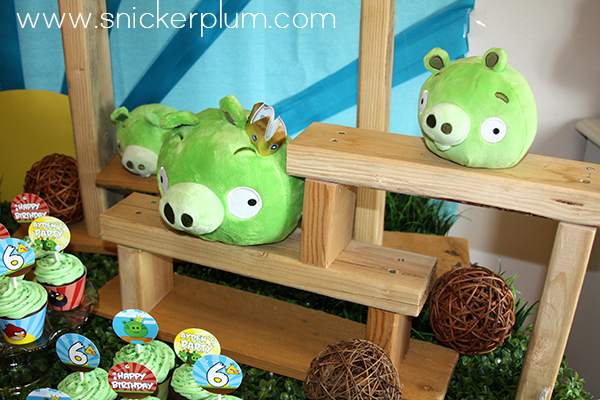 Then as you moved to the right of the table, I had the pigs set up like the game- with the wood at various heights. Now, this was easily made as well. It’s not necessary to use in the design, but like I said… I wanted it to look like the game. So I made my way into the garage and dug through my hubby’s scrap wood pile and found several little pieces of 2x4’s. I sanded the edges down and then just nailed them in different heights to create a stable stand of sorts for the pigs to sit on. You’ll notice I have lots of those stuffed animals. They aren’t cheap.. I know. But one thing I highly recommend doing is to search for the sales. I was walking through Target one day and they happen to have them on sale for way cheap. 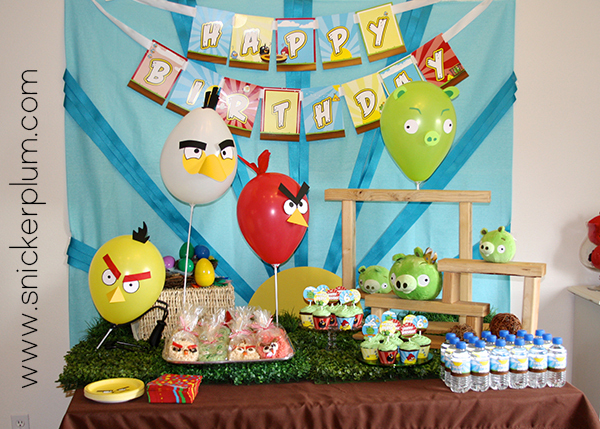 Knowing I wanted to do an Angry Bird party in the future, I grabbed as many as I could. It’s become somewhat of a habit of mine now lol. I scout stores as I go in them for things that could be used in future parties and buy them at ridiculous cheap prices. 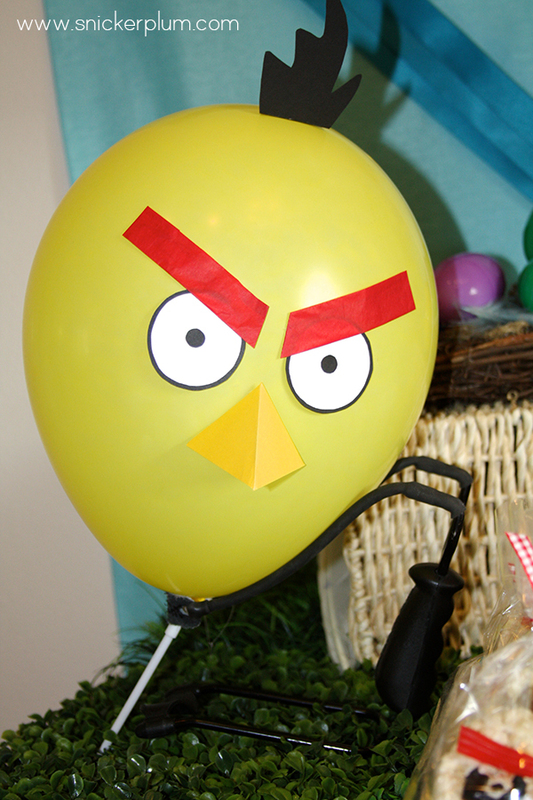 I also had a few baskets, easter eggs, and feathers that I had on hand too. If you don’t have these items, you can usually find them at D.I., Savers, or Goodwill for very cheap. 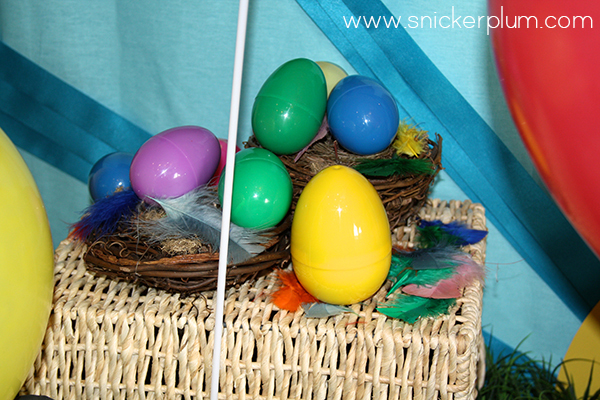 I had little nests that I borrowed and then staggered the eggs and feathers around them as a display for the main table as well. You’ll notice throughout the pictures, that there is “grass” on the table as well. Those are grass place mats I got from Hobby Lobby on sale. In the main package , you will also get an 11x17 sign to hang on your door. 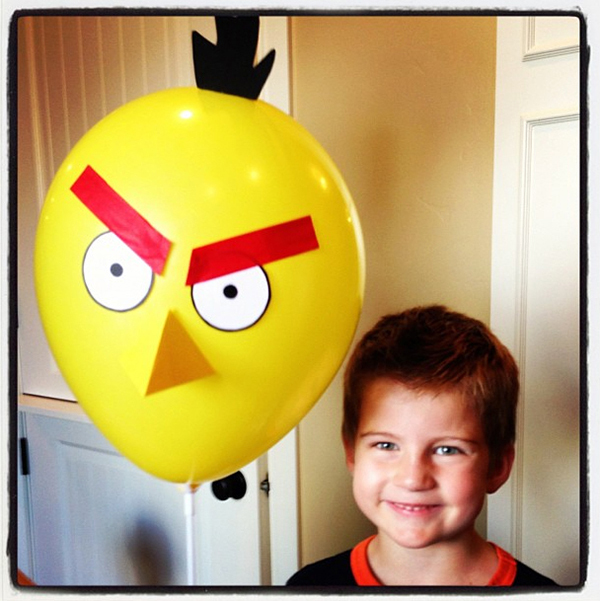 And here is my cute boy, all ready and excited for his big Angry bird party!